So now, many years later, as the weather turns to spring, I often take myself outside. I do something I learned since Drama School; I Commune with Nature. To me this means that I smell the roses, I see the clouds, I feel the breeze. I actively appreciate all that Mother Nature has on offer. I find it nourishing and life enhancing. (And I’m sure it has made me a better actress). I “BE in nature” and this invariably leads to me going for a walk. Walking in nature is like a meditation in movement. I love it. Walking is one of my favourite activities. To carry this on, our charity; Stepping Stone Theatre for Mental Health, is organizing a regular guided walk. Everyone is welcome. It will be a Walk and Talk – let’s get physical and let’s positively impact on our mental health by chatting as we walk. Walkers will be paired up with each other. They then can talk about everything or they can talk about nothing. No pressure. We will meet at 11:00 a.m. every second and fourth Saturday, starting in May. We will marshall at Marshall – sorry, that’s my attempt at humour. What I mean is - we will meet at the big green bear by the fountain in Marshall’s Yard, Gainsborough; (His name is Marshall, see the humour). 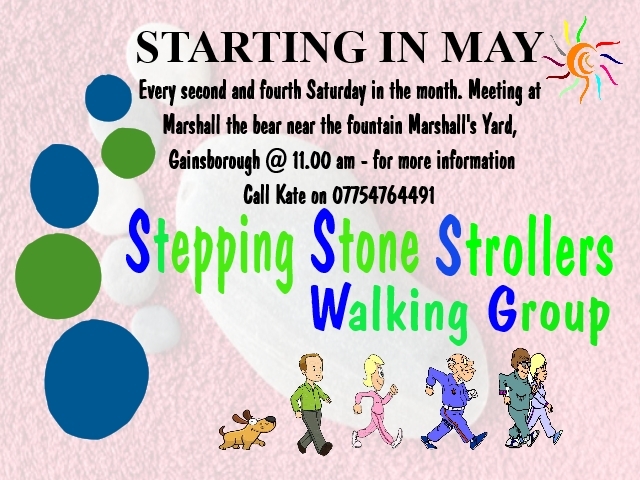 Stepping Stone Strollers, as we are affectionately calling ourselves, will ramble through the pedestrianized parts of downtown Gainsborough – looking for nature and chatting. It will take about 45 minutes. We will finish back at Marshall’s Yard. To conclude our lovely experience, and to solidify our newly formed friendships, we will go for a well deserved tea or coffee. Come and commune. A wonderful way to start your weekend. For more information contact me on 0775 476 4491.